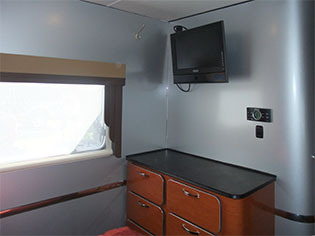 I was thinking the other day that many of you have not seen our new travel trailer, so I took some photos of the interior for you to see. 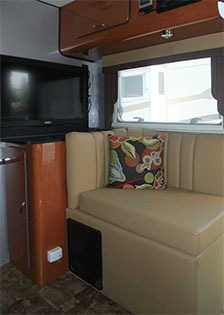 We bought this model at the RV show in Toronto last February and we just love our new trailer. 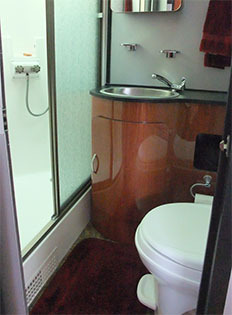 This innovative, eco-friendly RV design was built by Earthbound RV. Our Earthbound has no wood in its construction and only weighs 4,500 lbs (compared to 10,000 for our previous fifth wheel toy hauler), so for that reason we save about $50 a day on gas. Since we are travelling in the US for the month of June and the Canadian dollar is doing well, we are saving an additional $70 a day in gas, (which costs the equivalent of $1 per litre in the US). We generally stay 2 or 3 days in any one campground (so we have a chance to explore the area), and only tow our trailer a few days each week. John figures we will spend about $2,000 in gas in June (US travel) and $3,000 in July (Canadian travel). View from the entry door (which is in the living room), looking at the kitchen. Here, the kitchen slide is in the 'out' position, which makes the hallway about a foot wider. 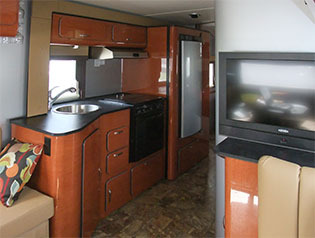 The kitchen has a 3 burner propane stove and oven and a 3 way fridge (will run on 120V, 12V or propane). Across the hall from the kitchen is our little bathroom. The shower has a built in seat (not shown). Here I am standing in the kitchen looking back toward the open entry door. The large living room with lots of seating was what attracted us to this floorplan, which is called Copper Mountain. There are so many storage cupboards in this trailer that it holds everything that we had inside our 31 ft fifth wheel trailer (other than the motorcycles that is!). Our Earthbound is 29 ft. long including the tongue. Our living room has this extra loveseat across the aisle. 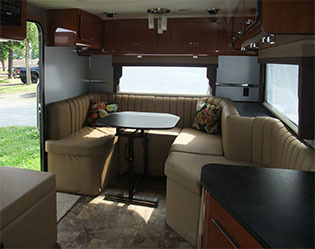 The Earthbound came with two flat screen TV's, propane furnace, air conditioner and radio sound system with three speaker zones (living room, bedroom and outdoor). John attached our satellite radio to the receiver. Here I am standing in the kitchen looking toward our bedroom. 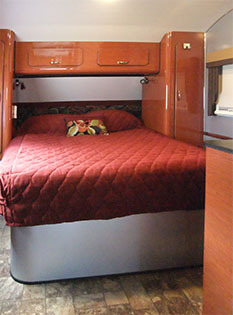 The queen size mattress lifts up on pistons to access the huge underbed storage compartment. The extensive closet space was another plus with this floorplan. This photo was taken standing beside the bed looking back towards the bathroom wall. I like having dresser drawers (like in our 1993 Award travel trailer). The flat screen TV is a real treat. All the windows have roll-up screens and blackout blinds and are hinged across the top for opening. I finally had time to read through your blog. Incredible, just incredible. Your trailer looks very comfortable. Glad you enjoyed the articles and photos. I took a WordPress seminar in January to get me started, which was extremely helpful. You need to register at www.wordpress.com first. Hopefully the tutorials there will help. You choose a template for the blog layout and add features you want (I added the subscribe feature). Before you load any photos it is best to edit them in Photoshop or other software you have (crop, reduce resolution to 100 dpi and reduce the photo file size to less than 100k). Then you just type in the articles and import the photos or vice versa. You can save the draft until it is all ready and then hit publish.